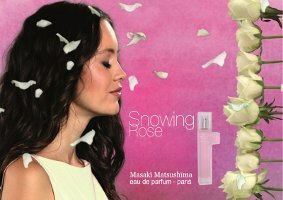 Japanese designer Masaki Matsushima has launched Snowing Rose, a new fragrance for women. Snowing Rose reflects a 'fantasy world where snow loses its chill but retains its grace and lightness'. Snowing Rose was developed by perfumer Jean Jacques; notes include watery notes, bergamot, white peach, rose, magnolia, lotus and white musk. Masaki Matsushima Snowing Rose is available in 40 and 80 ml Eau de Parfum. They’re not so common here, although Sephora carries a small selection. That is an extremely poorly done advertisement. Those roses almost look like bulbs of garlic they are so ugly. The falling petals are like giant flakes of dandruff from that womans grungy hair. Admittedly not my favorite ad ever, but doesn’t bother me nearly as much as it does you. Looks like a wind is blowing in a straight line, and in the same level the roses to the model, I am curious to smell the combination of the watery notes with the white peach.